What began in a 9-by-12-foot furnished office on West 46th Street in Manhattan has become an institution for actors. Back Stage has met each challenge, has adapted to unexpected situations, and continues to grow. Here's a timeline of the performing arts industry from "Back Stage's" beginnings in 1960 to present day. Great conversations and insights are a key component of what makes Back Stage's content stand out. 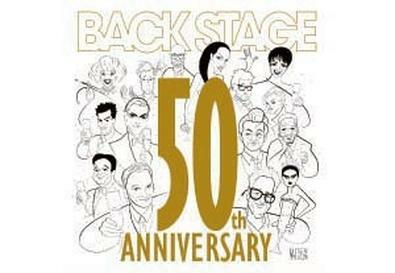 In honor of our 50th anniversary, Back Stage paired artists to talk about their craft. While George Clooney is an Oscar-nominated director, screenwriter and actor, he learned a lot about acting from working in television. Connie Britton, Joshua Leonard, Margo Martindale, Jesse Tyler Fergusen, Vera Farmiga, and Chris Colfer talk about getting their SAG cards. Back Stage asked a variety of artists to write about discoveries they made over the course of their work. Here's what industry notables observed when they opened their minds to the world around them. We asked some of our favorite actors about getting their SAG cards, audition horror stories, and other aspects of their careers. Thanks, Back Stage readers, for your kind words in celebration of our 50th anniversary. We couldn't have come this far without you. Here's to the next 50 years! Watch a slide show of Back Stage's covers through the years below.